Want to learn more about pesticide buffer zones? Go to the debate on Friday between college debate teams. Listening to a debate is one way that Hawaii residents can learn about and understand issues that are important in Hawaii. To that end, Ian Ross and Jonathan Chang of Debate Hawaii join Pod Squad host Chad Blair to discuss an upcoming debate on pesticide buffer zones. On Friday, debate teams from the University of Hawaii and Hawaii Pacific University will square off at the State Capitol. 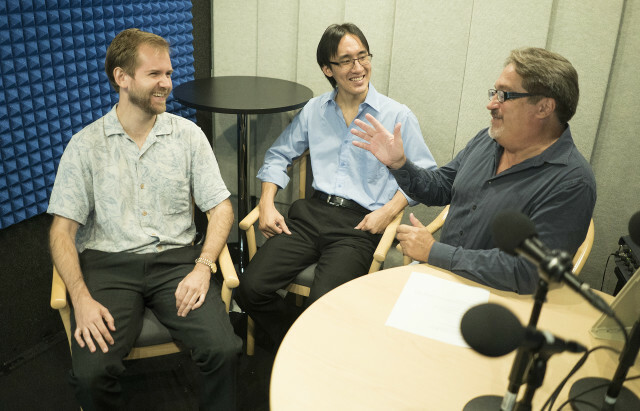 Ian Ross, left, and Jonathan Chan of Debate Hawaii talk with Chad Blair about the Capitol Debate series coming Friday. This debate is on pesticide buffer zones.